Brad, Jeff, and Ice Cream Social are profiled in their hometown newspaper, The Ithaca Journal, today. It’s a complex story and David Hill, a veteran business reporter, does a great job of laying out the ideas in plain language. Good journalism is hard work. Brad told David Hill, “I worked full-time on this book for a year-and-a-half. I interviewed over three dozen people and reviewed hundreds of pounds of internal documents. If they were not sincere, I think I would know it. And I really think they’re sincere. 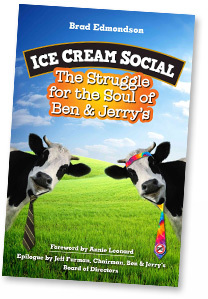 It was a great antidote to cynicism to see [that Ben & Jerry’s] really is trying.” Thanks, David.